Austin Clark asks Debbie Nice, category director facilities supplies at VOW, about the wholesaler’s exclusive MyCafé brand and what it means for dealers in the lucrative office drinks sector. Why is MyCafé important to resellers? VOW resellers are passionate about exclusive brands in the facilities supplies range as these help to differentiate them from the rest of the catering suppliers. Our brands are exclusive to the office products channel and this helps when resellers are competing with specialists in other markets. The MyCafé brand was designed to pull together some of the key items within a category and it’s got a striking red and black logo so that it can’t be missed! What is included in the range and what’s selling well? The MyCafé range encompasses catering products that are used in office kitchens, boardrooms and meeting rooms. For the initial launch we have focused on items for the office hot drink point – disposable cups, coffee, tea, water, sugar and stirrers. 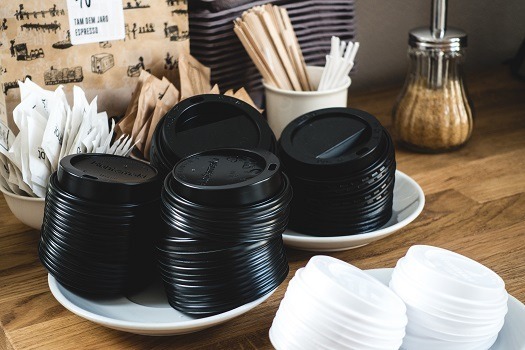 We’re not surprised to have seen a great first year for our disposables cup range in-line with the general growth fuelled by the takeaway coffee boom. The printed cups provide free advertising for the range as each carries a bold MyCafé logo. Bottled water has also seen spectacular sales this year, despite a very average summer. Our 15 litre water bottles fit most office water coolers and enable offices and boardrooms to have chilled water available without expensive cooler contracts. Our new product launch in November will start to show the evolution of the range into food takeaway packaging – particularly bags – where there is a massive opportunity for office products dealers to open doors with new catering customers – and also to pick up business from workplace canteens. MyCafé handy individual sugar sachets are becoming increasing popular in offices as they avoid wastage and are much more hygienic than a communal bowl of sugar. Can dealers be confident of the quality of the MyCafé range? MyCafé is designed for use in the workplace and we source the products from industry experts who ensure that all the relevant food safety legislation is covered. The disposable hot drink cups are all good quality and designed to withstand high temperatures which is imperative when serving coffee to go. Where does MyCafé sit in relation to the other ranges offered by VOW? MyCafé is one of four ranges in facilities supplies and it sits alongside other brands which are also used in hospitality and catering such as 2Work cleaning and Prestige till rolls. The coffee and tea is not designed to compete with the big brands that we love from home – but it’s a great, cost-effective alternative for a busy workplace. What support is available to help boost sales? MyCafé has been featured at dealer group events throughout the year and we’ve been sampling the tea and coffee. Our marketing department is producing a range of printed and online marketing materials and we’ve launched a support website – www.MyCafebrand.co.uk.